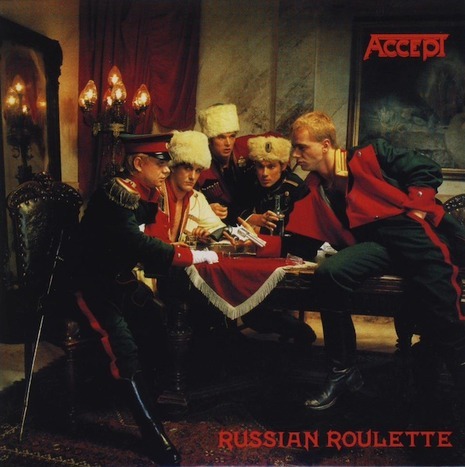 Russian Roulette is a 1986 release by German heavy metal band Accept. It was again recorded at Dierks-Studios, but the band chose to self-produce rather than bring back Dieter Dierks as producer. It would be the last Accept album to feature Udo Dirkschneider as lead vocalist until the 1993 reunion album Objection Overruled. Peter Baltes explained the album's title and front cover as an expression of the strong anti-war themes throughout the record, showing war as a game of russian roulette: "It means - go and play the game y’know, what a silly game it is. One will die definitely." The digitally remastered CD edition includes live versions of "Metal Heart" and "Screaming For A Love-Bite" as bonus tracks, taken from the Kaizoku-Ban album.